Under no circumstances are the New England Patriots a better football team in 2017 without the services of Julian Edelman. It would be downright foolish to think otherwise. The road to a sixth Super Bowl title – as well as 19-0 – just became increasingly difficult. Edelman isn’t just the best slot receiver in the NFL; he’s one of the best receivers in the NFL, period. Edelman, who tore the ACL in his right knee on the opening drive of the Patriots’ 30-28 preseason victory over the Detroit Lions on Friday night, has long been the fail-safe of New England’s offense. Perhaps no receiver in the Tom Brady era has garnered the trust of No. 12 more than Edelman. This is true going as far back as Deion Branch and Troy Brown, to the high soaring days of Randy Moss and Wes Welker and into the modern era with Rob Gronkowski and Danny Amendola. Look no further than the 2015 season as a concrete example of what Edelman has meant to Brady and the Patriots. Up to and including the game in which he suffered a Jones fracture in his foot early on in New England’s 27-26 Week 10 victory over the New York Giants, the Patriots were 9-0. They slumped to a 3-4 finish in the regular season – granted, without Gronkowski at full strength – but it’s telling that Brady’s completion percentage tumbled from 67.8 to 59.4 sans Edelman, while he averaged nearly 100 yards fewer through the air per game (338.1 vs. 246.7) minus Edelman. No receiver in the entire NFL had more receiving yards on third down than Edelman’s 431 in 2016, and no receiver averaged more yards per game (99.1) from Week 10 on – including the playoffs – last season than Edelman. He’s fifth in the NFL in receptions since the start of the 2013 season, with 356. Only Antonio Brown, Demaryius Thomas, Julio Jones and Larry Fitzgerald have caught more in the same time frame. Not bad company. The going just got that much more difficult for the Patriots this season. Edelman, at least partly, is who he is because of an opportunity afforded him due to his predecessor’s injury. Wes Welker tore his ACL in similar non-contact fashion to Edelman in a 34-27 loss for New England vs. the Houston Texans way back in Week 17 of 2009. Edelman filled in quite admirably for Welker, hauling in 10 passes for 103 yards in the penultimate game of his rookie season. The Patriots lost their playoff game vs. the Baltimore Ravens, 33-14, the very next week. Edelman was the only player who created any semblance offense for New England with six catches for 44 yards and two touchdowns. And despite inspiring performances as Welker’s understudy, it took three more seasons for Edelman to become who he is today – as important a person as anyone besides Brady in the Patriots’ run of success. 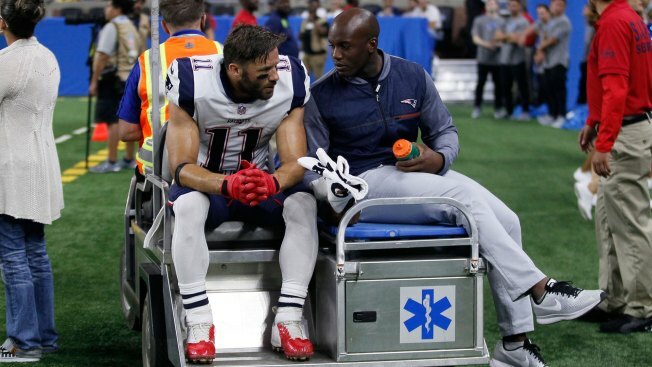 Edelman won’t play again until he’s 32 years old. We’ve become numb to the age of players around here, given Brady’s constant talk of playing well into his mid-40s. But 32 isn’t exactly young when it comes to a receiver who’s taken the beating Edelman has to this point in his career. Whether to prolong Brady’s window or to merely open Jimmy Garoppolo’s just a crack, the Patriots are going to need a younger receiver to emerge. Malcolm Mitchell had as promising a rookie season last year as any receiver in these parts since Branch, but he’s yet to play this preseason due to injury. There are a slew of prospects fit for the passing game still on New England’s roster as the preseason winds down, most notably wide receivers Austin Carr and Devin Lucien, tight end Jacob Hollister and running back D.J. Foster – who played some receiver at Arizona State. Even with Edelman’s injury, none should be considered a lock to survive cut down day on Sept. 2. At most, only one will make the 53-man unit Bill Belichick sets for week One vs. the Kansas City Chiefs. Yet there’s a distinct similarity between the youngsters and the other players who have mastered the slot position under Belichick and offensive coordinator Josh McDaniels. Carr, Hollister and Foster all signed with the Patriots as undrafted free agents either this season or last, while Lucien was a seventh round pick of New England’s in 2016. The slot machine triumvirate of Welker, Edelman and Amendola can trace their respective origins to similar beginnings. Welker and Amendola went undrafted, while Edelman was a seventh rounder in 2009. This is not to say that Carr, Lucien, Hollister or Foster will be able to fill in seamlessly for Edelman this season. With the cast of characters Brady has at his disposal, even if one of them does last into the regular season, there are no guarantees they’ll be active on game days. Gronkowski, Amendola and Mitchell, in addition to Chris Hogan, Brandin Cooks, Dwayne Allen and New England’s stable of running backs, will ensure the Edelman injury becomes anything but dire for the Patriots. But for a team which prides itself on a mantra of ‘next man up,’ the opportunity is there for the taking. The thought of Edelman becoming who he has was far fetched once upon a time. He took his chance and morphed in to the kind of receiver who Brady has a 4.9 (215-44) touchdown-interception ratio with when he plays, compared to 1.7 (33-19) when he doesn’t. The emergence of another young receiver in New England’s offense certainly can’t hurt the 2017 Patriots. More importantly, it can help the unit in 2018 and beyond.